1 oz. cerium oxide - $9 (For larger quantities, I suggest www.hisglassworks.com or you might try your local glass supplier.) Click here to read about using cerium oxide to remove etch marks from glass crystals. Clear glass crystal adhesive. This is the best glue to use when glue is needed for crystal fitting. 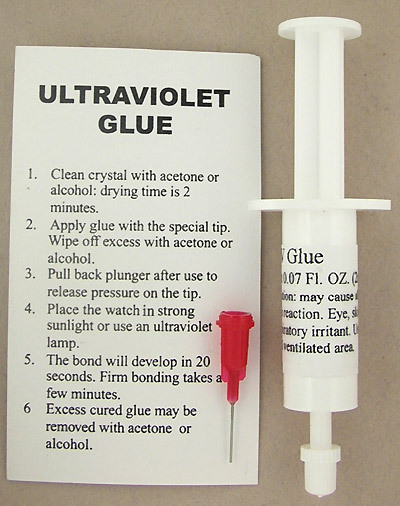 UV glue allows virtually unlimited working time to apply the glue, fit the crystal and clean up any squeeze-out. Once you are happy with the fit, just put the bezel in the sun for 10-15 minutes, or under a UV lamp for a few minutes and the glue will cure. If you do not know what size crystal you need, I can fit crystals to your bezel or case. The cost for this service is $25, plus the cost of the crystal. Return shipping is included. Please do not send complete watches -- just the bezel or case. For the most part, American pocket watch makers did not case their watches. Instead, they sold their movements to 'jobbers' who then sold them to jewelers. Pocket watch case makers did the same thing. When someone wanted to buy a watch, they went to their jeweler, picked out a movement and then picked out a case. The jeweler then cased the movement for the customer. Therefore, knowing the maker of the movement does not help one decide what crystal should be used for the watch. Furthermore, there was little standardization among case makers, so even knowing the case maker does not help determine the size of crystal required. Pocket watch crystals are supplied (approximately) in increments of one-tenth of a millimeter. 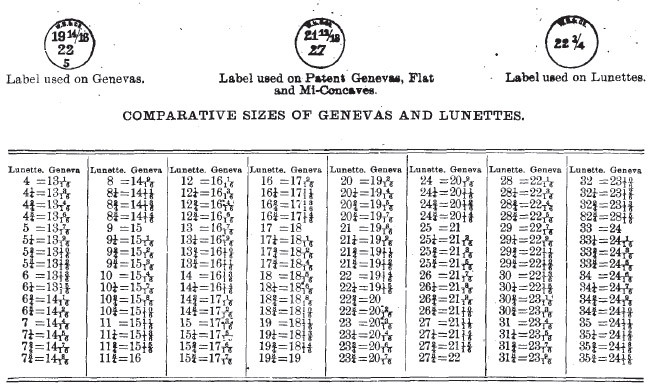 They are actually supplied in increments of one-sixteenth of a 'ligne', but there is a fairly close approximation to tenths of a millimeter. Since we (today) have access to digital calipers that will measure in tenths of a millimeter, that is what is most convenient for us to work with. If you look at the chart below this box, you will see the conversion between lignes and tenths of a millimeter. 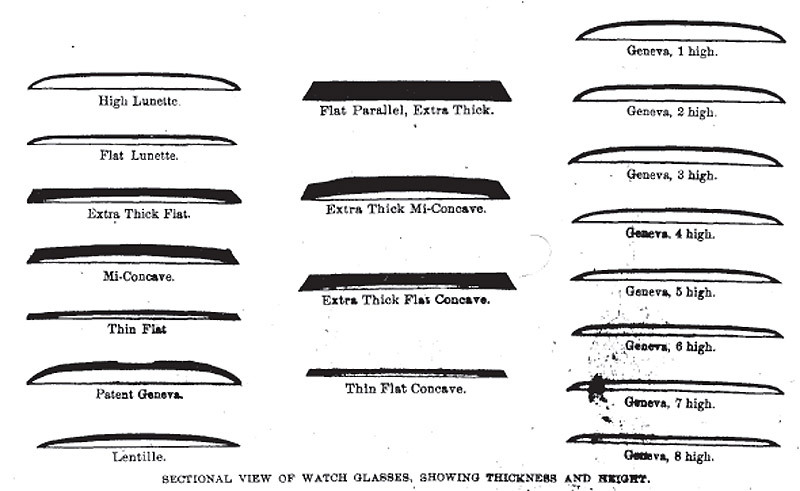 Figure 1 shows an enlarged cross section of a bezel. Note that there are three measurements of interest. The first is the bezel opening. This is the opening that the crystal must fit through. Next you will see the diameter of the crystal itself. Finally, you will see the opening in the crystal seat. It is, of course, important that you measure the bezel opening rather than the crystal seat opening. If you order a crystal that matches the crystal seat opening, your crystal will fall right through the bezel. Now, if you look at the crystal diameter, you will notice that it is larger than the bezel opening. How is this possible? What you are seeing here is the absolutely correct way of fitting a crystal. One will typically find the crystal that just fits through the bezel opening. The next size up will then be the correct crystal. It is possible to finesse this larger crystal into the opening. It will then stay in the bezel without any glue. Fitting this crystal will be much easier if you have access to a 'bezel warmer' such as the one shown below. Heating the bezel will expand it slightly so that this larger crystal will drop through the bezel opening. When the bezel cools, the crystal will be held firmly in place. Very few people have access to these bezel warmers, but a hot plate, or even a pot of boiling water might be a reasonable substitute. If you do not feel comfortable fitting a larger crystal, a crystal that just fits through the bezel can be used and glued in place. 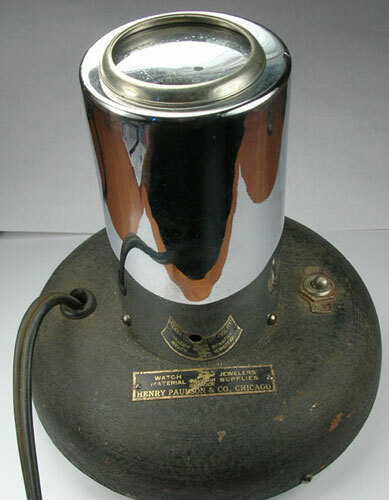 The best glue that you can use for this purpose is UV curing glue. This glue dries absolutely clear. The other advantage of UV curing glue is that it has an almost infinite 'working' time as long as it is not exposed to UV light. Therefore, you have plenty of time to apply the glue to the bezel, seat the crystal and clean up any squeeze-out without having the glue set up on you. When you are finished, you simply set the bezel out in the sun for 10-15 minutes, or expose it to UV light for a few minutes, and the glue will cure. The other imporant aspect of fitting your own crystal is what type of crystal to buy. The first thing to consider is whether your watch is an 'open face' or 'hunting case' watch. Basically, hunting case watches have a solid cover that closes over the face of the watch. Open face watches do not. Hunting case crystals are much thinner to fit under that cover and come in a variety of 'heights'. You will need to choose a height that is high enough to clear the hands but low enough to fit under the cover. Open face crystals come in a variety of styles. The typical beveled crystal that you see on most American pocket watches is the Mi-Concave.